What is the best time to start to teach our children about responsible consumption and food? Our answer is: „The sooner the better!“ And the kids from Dječja Mašta kindergarten from Čakovec in Croatia could be a great example. They are learning about nature, plants and food while playing and having a good time with their friends. 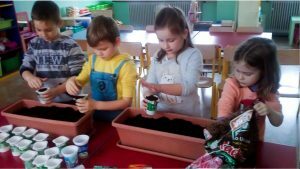 During the We Eat Responsibly project The Čakovec kindergarten decided to focus on local and seasonal food with inspiring results in a brand new garden and apple orchard. 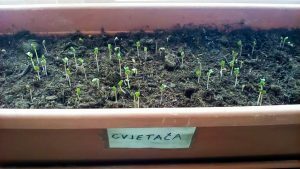 Kids in Dječja Mašta already knew that we have to take care of the garden and work there during the whole year. 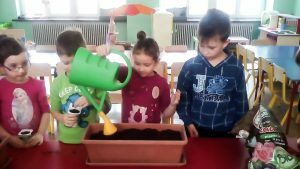 So, despite the fact it was still winter time and their garden was „sleeping“, they already started to think about what kind of plants they want to grow there. With the help of parents and teachers, the kids prepared a real hotbed for seeds. They collected old yoghurt cups and found suitable soil and seeds. However, their work was not over yet, they still had to take care of their hotbed by watering and thinning it on a regular basis. This way, the kids learnt about the life cycle of plants. They understood how a little seed could become a real plant that we could use for cooking. They could see how the seed grows up into a seedling, all thanks to their care and work. And then, when the time came, the seedlings were placed into the vegetable garden. In their vegetable garden you can find various plants – cauliflower, eggplant, cucumbers, carrot, peas and many others. But what could be done with all of this? So, the kids also became little cooks and helped with cooking meals using the produce from their garden. The kindergarten even managed to reduce its food waste, because the kids started to appreciate their own work and effort and became more responsible. Now they waste much less food than before. Even though they are young, the kids discuss important food issues every day and help prepare their meals. So, education about food is fun and adventure for them. Thanks to that, they will develop the right habits and create a strong relationship with nature. Teachers want them to learn organizational skills, cooperation, teamwork, fine and gross motor skills, but mainly, to have a great time with their friends while learning how to be responsible.